There’s a new take on aerospace engineering, one that encompasses and engages woman engineers who want to fly high. With redesigned aircraft, a refocus on space exploration and new companies emerging, existing job opportunities in aerospace and defense abound. According to the U.S. Bureau of Labor Statistics (BLS), the job outlook for this sector will increase 6% through 2026 - and women engineers will be part of that move. Here a few share their thoughts on the aerospace and defense industry’s outlook and how they’ve made a career out of flying high into the stratosphere in terms of success and accomplishments. For more than a century, businesses, government and military leaders have turned to 24,600-employee, McLean, VA-headquartered Booz Allen Hamilton (BAH), to solve complex problems. For the past eight-plus years, Rebekah Anchodo has been an integral part of achieving highly complex solutions. As senior lead engineer, vehicle configuration lead, she heads BAH’s modeling, analysis, visualization, robotics and integration (MAVRIC) team, which performs high-fidelity modeling simulation and multidisciplinary engineering analysis on International Space Station (ISS) configurations. With a Bachelor of Science in aerospace engineering, a Master of Science in systems engineering and certification as a certified systems engineer professional (CSEP), Anchodo completed four co-ops as a propulsion engineer (PROP) flight controller in the mission control center (MCC) for NASA’s Space Shuttle Program. “Humans have always had a desire to explore, and find discovering the unknowns of space important and thrilling. A career contributing to space exploration is not only fulfilling, it also makes coming to work a joy,” she says. According to Anchodo, while women are often attracted to the awesomeness of aerospace, woman engineers may not fully realize the correlation between public service and aerospace - that is the ability to protect the safety and security of the explorers that risk their lives to better the world’s understanding of the space domain. While an engineering degree delivers entrée to solving problems, Anchodo finds it necessary when faced with challenges that involve creative solutions. “While perfecting your technical background is essential, so is working well within a team that brings together diverse people and perspectives to reach a common goal,” she states, adding respect and excellent communication to that equation. “Booz Allen Hamilton seeks people who are highly driven and passionate about the mission; people willing to change the world. It needs complex problem-solvers able to take on technical challenges without obvious solutions,” she remarks, noting that she enjoys working with colleagues to develop solutions to further space exploration. She recently took on the role of deputy program manager (DPM) of the company’s Women in Engineering and Space (WiES) organization, which focuses on several objectives, including providing opportunities for leadership, development, recruitment of a diverse workforce, promoting networking and offering recognition opportunities for members. For more information about Booz Allen Hamilton, go to bah.com, boozallen.com/careers.html, Instagram, Facebook, Twitter and LinkedIn. A senior propellant engineer at 5,000-employee, Sacramento, CA-headquartered Aerojet Rocketdyne, Teresa Sells holds a Bachelor of Science and a Master of Science in chemical engineering. Employed for the past two years at this aerospace and defense leader that supports domestic and international markets, Sells’ decision to apply for an internship during the summer between her undergraduate and graduate studies was intended as a surprise for her Aerojet-employed dad. But it soon morphed into a passion. “I had experience in polymer physics and was able to incorporate new polymer characterization methods that helped propellant engineers in their research,” she explains. Somewhat sad to leave for grad school, Sells remained in touch with her supervisor, and once she graduated, she was on her way back to Aerojet. Sells’ primary role is leading cutting-edge, advanced propellant development projects for high-tech prototype demonstrations. She also works on modeling and simulation projects aimed at predicting and optimizing solid rocket motor performance. Of the opinion that maintaining a culture of acceptance is vital to encouraging a diversity of people to enter the workforce, she’s pleased to see that at Aerojet Rocketdyne. As for needed skills, Sells finds that besides a general knowledge of engineering, there’s an increasing need for scientific software. “The ability to code is a valuable skill, and one that our company takes into consideration when filling intern and full-time positions,” she mentions. Sells is appreciative of Aerojet’s provision of an outstanding work-life balance that includes 9/80 scheduling, allowing her to work every other Friday, as well as a plant shutdown during the holiday season. She further appreciates the on-going positive feedback she receives from supervisors and management. For further information Aerojet Rocketdyne, visit rocket.com, aerojetrocketdyne.com, rocket.com/careers, aerojetrocketdyne.com/careers, Facebook, YouTube, Instagram, LinkedIn and Twitter. Headquartered in Bloomfield, CO, Ball Aerospace is well-known for creating innovative space solutions that drive insightful observations of the planet, deliver actionable data and intelligence, and ensure that those who depend on freedom go forward bravely and return home safely. “A spacecraft and payload developer, Ball pioneers discoveries that enable customers to perform beyond expectations and protect what matters most,” says Shannon Morgan, a program manager at this 3,500-employee company. Morgan holds a Bachelor of Science in aeronautical engineering. She joined Ball two years ago after working in the industry for 13 years. “From the moment I interviewed I knew the fast-paced, innovative environment at Ball was where I wanted to be,” says Morgan. She now leads a team of experienced engineers that work on building the company’s next-generation low-observable (LO) antennas, something that’s in demand. “The LO antenna sector is growing rapidly,” she notes, acknowledging that while that growth can be challenging, this is an exciting time to be in this industry. In her role she’s additionally called upon to interact with customers to provide answers to technical and procedural questions. Consistently presented with new opportunities, Morgan expects a bright future for Ball, which continuously strives for bigger and better technology to grow the company. She’s delighted to see more female engineers integrating into the aerospace sector. Morgan believes dedication to work and eagerness to learn are strong attributes. Her advice is to find about what it is you’re passionate. She recalls with fondness the many incredible opportunities she’s been given. “Every moment in my career has meant something very special to me, and I’m pleased to pay that forward,” she shares. For more information about Ball Aerospace, go to ball.com, ball.com/aerospace, ball.com/aerospace/about-ball-aerospace/careers, LinkedIn, Facebook, Instagram and Twitter. From 2015 to mid-2018 Christine Sleppy worked at Lockheed Martin as a contractor through the University of Central Florida (UCF) as part of the college work experience program (CWEP). Later in 2018 she then became a full-time employee at this 100,000-employee, Bethesda, MD-headquartered company. She now holds the title of reliability engineer, apache program and biomechanist, exoskeleton technologies program. A global security and aerospace company, Lockheed Martin received three Edison Awards for ground-breaking innovations in autonomy, satellite technology and directed energy. Sleppy fits right in, with a Bachelor of Science in electrical engineering and a Master of Science in biomedical engineering with a biomechanics focus. “My academic rigors at UCF helped provide the technical foundation necessary to take on the challenges of my current work, while the CWEP program allowed me to exercise that knowledge in a real-world environment,” she explains. As she developed those skills, she additionally established a professional network, all of which contributed to her job preparation. As a reliability engineer, Sleppy supports equipment and data analysis to improve fielded hardware. As a biomechanist, she studies the physiological impact of the ONYX exoskeleton, best described as a wearable robot, and conveys those findings for future consideration and designs. She additionally participates in training and performance assessments of the ONYX exoskeleton. While acknowledging that her career has just begun, Sleppy is excited to be part of a community that focuses on advancing the state-of-the-art. Her advice to future female engineers is to stay driven. Lockheed Martin has a significant number of woman engineers, and she attributes that to the company’s diversity and inclusion efforts. Though she emphasizes the importance of technical aptitude, Sleppy also finds self-motivation to be a critical attribute, especially when confronting situations with limited oversight. “In such circumstances, it’s essential to have the drive to get the job done,” she says, further highlighting communication skills. “You only get one chance to make a first impression, so make it a good one,” advises Sleppy, who enjoys supporting the development of technologies she finds exciting and thought- provoking. For further information about Lockheed Martin, go to lmco.com, lockheedmartinjobs.com, Facebook, YouTube, Instagram, LinkedIn and Twitter. For the past 10 years Chanda Cherry has worked for Norwood, MA-headquartered Analog Devices (ADI), a world-leading semiconductor company with 15,000 employees that specializes in high-performance analog, mixed-signal and digital processing (DSP) integrated circuits (ICs). 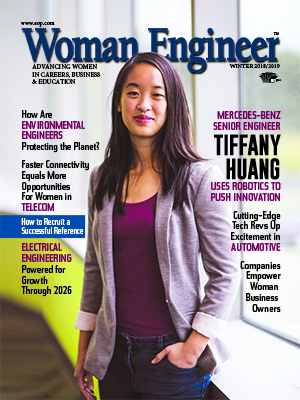 She holds bachelor’s and master’s degrees in electrical engineering. “During grad school I worked on various research projects,” she indicates, crediting this research with providing the experience she needed to work as a test/product engineer. Today Cherry’s product development responsibilities include hardware and software test development and platform conversion for production and bench testing for a variety of products. As technical lead and supervisor, she reviews and advises engineers on product test coverage, hardware designs and product feasibility. Noting that she must, in her position, be more than a product development engineer, Cherry is constantly mindful of the problems her customers need to solve, and works to design solutions that address their specific concerns, especially in the harsh environments space products encounter. For success she stresses the importance of paying attention to detail, being organized, having the ability to multitask, being a team player and possessing excellent communication skills. “With so many challenging factors involved in space products, the importance of demonstrating a willingness to share information and learn from each other cannot be overstated,” she adds. Cherry enjoys overcoming challenges and helping to bring out untapped potential that advances both group and company expertise. For further information about Analog Devices go to analog.com, careers.analog.com, LinkedIn, Facebook, YouTube, Google+ and Twitter. As a space, defense and helicopter commercial aircraft manufacturer, 130,000-employee Airbus is a worldwide leader in the design, manufacture and delivery of aerospace products, services and solutions. With Airbus for slightly more than a year, Marzieh Atigh is based at the company’s engineering center in Mobile, AL. She’s a version engineer, A380 floor-to-floor lining. Holding a master’s degree in mechanical engineering, Atigh had a youthful fascination with aircraft that surfaced while participating in a hands-on design-and-build RC Aircraft project sponsored by Airbus. “This passion, combined with my educational knowledge of aerospace, and guidance from Airbus, led me to redirect my career focus,” she relates. Charged with developing conceptual and detailed designs that meet customer requirements in the sidewall light cover areas for Airbus A380, Atigh interfaces with other cabin module teams, including ceilings, doors and dados (panels). She creates version splits for incorporating changes based on customer requests, revises existing models based on manufacturing and design requirements and works with suppliers to resolve engineering-related problems. According to industry estimates, Atigh reports the commercial aviation sector is growing rapidly, with an annual increase in demand. “The cabin is one of the most customizable areas of the aircraft and one where customers have a meaningful say in influencing cost and design. I see this sector having exponential growth and a great need for skilled engineers,” she states. However, while there’s an insatiable demand for engineers across the world, she believes the profession must overcome its long-standing challenge of attracting and retaining females. Her hope is that by initiating more internship and engagement programs on campuses and in workplaces, as well as encouraging young girls to develop spatial skills, this will help to inspire more women to consider STEM careers. While new hires bring new ideas and perspectives, developing agile and diverse teams are key to promoting effective efficiency. “Team members need to engage in outside-the-box thinking, increase communication skills, adopt a positive attitude, cultivate a zeal for learning and promote continuous improvement,” notes Atigh. She further cites interpersonal skills and the ability to work with multicultural and multinational teams as important for helping individuals excel. Atigh also enjoys expressions of appreciation from supervisors and coworkers, and applauds the company’s desire for growth on the part of their employees, as well as the offer of flexible work scheduling, of which she took advantage while completing her graduate degree. For further information about Airbus, go to company.airbus.com/careers, airbus.com, Facebook, YouTube, Instagram, LinkedIn and Twitter. A 10-year employee at Chicago, IL-headquartered Boeing, the world’s largest aerospace company, Shannon Timke is currently the flight-test operations lead engineer. “Ensuring safety, reliability and meeting regulations to validate the worthiness of Boeing products is my charge,” she states, noting that before airline products are delivered to customers, engineers and test pilots conduct tests in extreme high-altitude, high-wind and hot- and cold-weather environments throughout the world. As we become more globally connected, Timke sees enhancements in aerospace generating increased mobility and opportunities. She stresses the need for knowledgeable technical background, as well as strong communication and collaboration skills. These are critical, she contends, for employment at a company the size of Boeing, where working groups are spread across different time zones around the world. “As we continue to develop new aerospace products and services, Boeing is constantly seeking engineers with a range of experience who are able to pave the way for the future of flight test,” states Timke, who holds a Bachelor of Science in aerospace engineering. She underscores the flexibility and innovation of Boeing when it comes to providing alternate work schedules and affinity groups focused on career development for women and minorities, She also points out Boeing’s strong culture of mentorship, and diversity and inclusion. Resource groups contribute to the company’s goals to hire and retain the best talent. In addition to working to increase cultural awareness, these groups assist employees from diverse backgrounds with networking, developing professionally and connecting socially. Timke values the friendships she’s made over the years, and shares her endless excitement at seeing final products before delivery. “A test team can only be successful if there’s a foundation of trust, which also allows friendships to form naturally,” she believes. To help connect directly with people interested in flight test, she participates in job-shadowing activities and one-on-one informational interviews that provide clarity about the job and the fun it delivers. For further information about Boeing, go to boeing.com, boeing.com/careers, Facebook, YouTube, Instagram, LinkedIn and Twitter.